Kids of all ages love magic tricks! 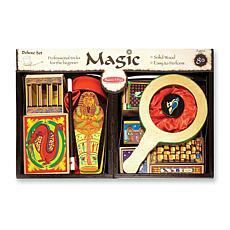 Let your little ones unlock their inner David Copperfield with one of our unique and fun-filled magic kits. Whether they're based on props, cards, or sleight of hand, our magic kits for kids are sure to provide hours of entertainment. Make items appear and disappear at will, pour from seemingly empty cans, and run prop swords through objects — just like magic! If your family is planning a birthday party or another important gathering, it's a great idea to give one of these magic sets as a pre-celebration gift, so your young one can prepare a magic show for the big day. If you're attending someone else's birthday, remember that kids' magic sets make awesome gifts. Maybe the recipient will consider a career as a Vegas magician someday! 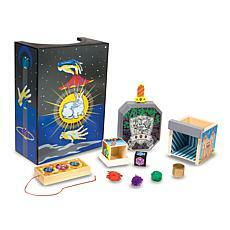 Our magic sets for kids provide a variety of tricks for all skill sets and ages. Even beginners will find these tricks easy to master. Most of our magic sets for kids include instructional DVDs so they can become experts in no time. With a bit of practice, your child will be throwing magic shows that will impress all the kids in the neighborhood... and many of the adults as well!